Last week we saw T-Mobile begin celebrating April Fools’ Day a little early with the announcement of the Phone BoothE, but it turns out that T-Mo’s got another joke up its sleeve for April 1st. The T-Mobile Phone BoothE Mobile EditionE is a portable version of T-Mo’s privacy booth. 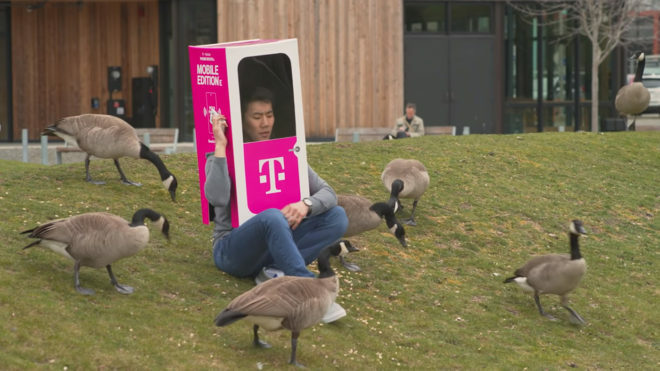 While it doesn’t have the same soundproofing as the standard Phone BoothE since it’s a cardboard box that you slip over your head, T-Mobile has included a clear panel in the front so you can see where you’re going and “BluetoothE” so that can actually hear your phone when you’re holding it up to the box. As with the Phone BoothE announcement, T-Mobile is introducing the Phone BoothE Mobile EditionE to poke fun at AT&T and its 5G E coverage. “And of course, you know this is real new technology because we put an ‘E’ on the end of the name of it,” said T-Mobile CEO John Legere of today’s announcement. AT&T’s 5G E isn’t actual 5G, but instead uses LTE Advanced tech like 4×4 MIMO, 256 QAM, and carrier aggregation. If the T-Mobile Phone BoothE Mobile EditionE were a real product, would you get one? Can’t get better than this with T-Mobile ! Yes you can… they made these! I commented “Ill take 4” as a joke and they are sending me one. It really does get better with them lol. This is just a new place for addicts to shoot up in. Thanks T-Mobile.